Denver, Colorado (CNN) - As a lifelong Denver Broncos fan, I’d have to be crazy to second-guess my team’s signing of the great quarterback Peyton Manning, assuming he’s as healthy as Broncos’ Vice President John Elway wishes him to be. And I’m not crazy. I got chills watching Manning hold up the new #18 Broncos jersey at his introductory press conference, and I’ll be counting the days until his September debut. But as a Tim Tebow scribe, general religion nerd, and sucker for inspirational sports stories, I’m mourning the loss of something special, something larger than football, and something Denver may never have again no matter how many championships the team wins. Tim Tebow is moving to New York to play for the Jets. Ten weeks ago last Sunday, I fell to my knees in my friend’s living room as Tebow threw a strike to wideout Demaryius Thomas to open overtime against the Pittsburgh Steelers in the first round of the NFL playoffs. Thomas ran 80 yards for the score that won the game, and I genuflected before the television, shouting Tebow’s name. He had thrown for 316 yards, led my Broncos to their first playoff win in six years, and made good on a season of shaky promise. On that day, Tebow wasn’t just what he had been all season long — a polarizing religious athlete, questionable quarterback and reliable comeback kid. As I watched Thomas saunter into the end zone, I saw Tebow finally cementing his place with the Denver Broncos. Whatever happened the next week didn’t matter (and it’s a good thing, because the Broncos would get crushed by the New England Patriots). Tim Tebow was the future of the Denver Broncos, and the future was now. I shouted and clapped my hands. I spent the next hour drowning my head in Twitter for confirmation after confirmation that yes, the Broncos had nabbed the most decorated free agent ever. Peyton Manning — Peyton Manning! — was a Denver Bronco. Later that morning, someone asked me how I felt about Tim Tebow. He hadn’t yet crossed my mind. Maybe I’m fickle — it’s a familiar trait of sports fans — or maybe I’m devoted to the Broncos first and their players second. My childhood bedroom was an orange and blue shrine wallpapered with clippings of Broncos stories from the Rocky Mountain News, Denver Post and Sports Illustrated. As an adult, my love of sports has merged with my love of studying religion, and I’ve been tracking the Tebow story and its religious angles since he entered the University of Florida. Last fall, I wrote a Tebow e-book and several Tebow stories, gave dozens of interviews on the Tebow phenomenon, and treated Broncos games like pieces of performance art. They were frustrating and weird and begging to be interpreted, as the Broncos scored precious few points but often won by hook or by crook of Tebow’s stubborn heroics, punctuated by prayer and a post-game shout-out to a sick young man or woman whose presence at the game was always the best part of Tebow’s day. I love Tebow’s story in part because it’s a misunderstood story. He gives the lie to many stereotypes about conservative evangelicals. Sure, he has missionary zeal, and his faith rises to the surface of his language with regularity, but he isn’t a virulent culture warrior. He doesn’t seem to see Christianity as something that needs to be protected from outsiders or critics. He doesn’t have a public faith agenda beyond saying Jesus’ name after games and helping sick people. He doesn’t even believe God helps him win football games — all that game-time prayer is reflexive religious passion, pure and simple. If Tebowing taught us anything, it’s that plenty of people of all faiths don’t have a problem with public prayer, at least when politics is out of the picture. No argument here — but the culture story of Tim Tebow brought a lot of people to sports last year, and it gave sports people the occasion to reflect on the meaning of the game. There was plenty of Tebow hatred and Tebow fatigue — and plenty more ignorance of the content and meaning of Tebow’s faith — but there was also a remarkable amount of thoughtful, generous responses to this unique religious sports figure. 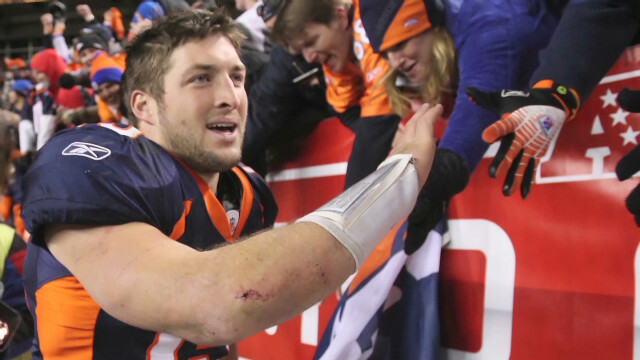 One of the most shared and most discussed sports articles I’ve seen in ages was Rick Reilly’s “I Believe in Tim Tebow,” an account of Tebow’s habit of meeting with the sick and dying before and after every football game. Or take Chuck Klosterman’s “The People Who Hate Tim Tebow,” an attempt to understand the epistemology of faith, fandom, and disbelief. How often do we get reflections like that in the middle of a sports season? Tebow didn’t add the qualities of virtue and faith to sports — they were already there in spades, but his story forced us to pay close attention. Were Norman Mailer alive, he may have delivered to us something like his famous coverage of Muhammad Ali. Mailer may or may not have liked Tim Tebow, but he would have recognized the young athlete as a moment of American culture that warranted a major response. So I do have mixed feelings about the Broncos’ move. Winning with Manning will be fun, but winning with Tebow is the better story. Shortly after New England finished decimating the Denver in the playoffs, I sat in the interview room at Gillette Stadium waiting for Tebow to emerge from the locker room. I wasn’t the only “culture” writer there — GQ, The New Yorker, and People had reporters in the room, because at the time Tebow was still the nation’s biggest story. Still, the only questions being asked of Tebow were about football. Thanks for listing these sites for us. You have done great job. I like this. Keep sharing with us. I completely understand the dislike for him as a player. He has poor mechanics, leans back instead of leaning into the pass, doesn't stay in the pocket and relies too heavily on his legs, has accuracy problems, and he seems to only show up for part of the game. The whole religious thing is been played up too much by the media and by angry atheists that find it necessary to hate everything religious and feel that religion is being forced on them when it's someone simply expressing themselves. Anyone that does is not a true atheist, they are people just angry at God. A true atheist wouldn't care. Just like they don't attack Buddhists, Wiccans, or any other religion. They don't feel they have to prove religion wrong because to them religion proves itself wrong based on logic. They are the ones pointing out his flaws as a player not questioning his character based solely on the fact he has a belief a God. MY PREDICTION IS THE POPE ARE TRYING TO GO AFTER TEBOW BANK ACCOUNT. Yes, many of us dislike Tebow a lot. I, for one, don't like someone sticking his religion in my face, especially when I'm watching a sporting event. And that's exactly what he does. He doesn't find an obscure spot on the sidelines to to pray that he's a better player than his opponent. No he seeks out a prominent spot where everyone, including the TV cameras can see him. And of course the cameras accomodate him. Long before there was Tim Tebow..there was Giants TE Mark Bavaro.As for the Jets..I think they picked him up for 2 reasons..jersey sales and they need all the prayers they can get.Go Giants!We have the better of the Manning brothers..Peyton..1-9 in playoffs..1 Superbowl...Eli..2 Superbowls in 5 yrs..thank you NE. Peyton is 36 years old right? Tebow is all of 24. John Elway messed up here, take a page from the Green Bay Packers playbook and have him sit behind Peyton for three years (see Aaron Rodgers and Matt Flynn). Afterwards Peyton will be washed up and ready to retire and Tebow would have actually been a legitimate NFL Quarterback. It isn't like they received anything they could have turned down for that trade with Tebow. I think that Tim Tebow deserves a break today. He needs to have it his way with his old fashioned taste. Personally, I'm loving it. Tim Tebow thinks outside of the bun and loves that chicken from Popeye's. I only hope that he continues to eat fresh. So I just noticed that comments of support for a good individual are few and far between – whereas comments of discord and hate towards "belief" or "what it all means" or "how we're all going to die" or fear of anything outside of predatory nature seems to be the widest path. What was it is said about the narrow and wide gates in Matthew? I've noticed there are always, atheists, evolutionists, nonbelievers, etc., on "belief" blogs and Christian blogs. Why is that? I believe it's a yearning in their spirits for God, but have convinced themselves He doesn't exists or that they don't need God. I want to say, those of us who are true Christians still Love all of You anyway. Peace.. I've noticed that there are alot of "believers" on "belief" and Christian blogs. Why is that? I beleive its a telltale sign that they have doubt and need a fix. Personally, I get on Christian blogs to try to wake them up from their delusional thinking, or non-thinking. I want to say, those of us who are not christians, still love all of you anyway. Peace.